Criminal lawyer and bestselling mystery author Erle Stanley Gardner wrote nearly 150 novels that have sold 300 million copies worldwide. Now, the American Bar Association is bringing back his most famous and enduring novels - featuring criminal defense lawyer and sleuth Perry Mason - in striking trade paperback editions. Married Eva Griffin has been caught with a prominent congressman, and is ready to pay the editor of a sleazy tabloid hush money to protect the politician. But first Perry Mason tracks down the publisher of the blackmailing tabloid and discovers a shocking secret, which eventually leads to Mason being accused of murder. This is the first Perry Mason mystery and our introduction to secretary Della Street, detective Paul Drake, and the great lawyer himself. ©1945, 2011 Erle Stanley Gardner (P)2016 Brilliance Audio, all rights reserved. The true Perry Mason, hard boiled detecting at its finest! This is the first Perry Mason book and it’s as hard boiled as a two dollar steak. This is the true Perry Mason, not just courtroom lawyer but a guy who does his own detecting, and isn’t afraid to get his hands dirty. He is as hard boiled as they come. Think of Phillip Marlowe with a law degree. If you love the 30s hard boiled lone wolf detective story, you are in for a treat. And there are many many more! I'd never read a Perry Mason novel before, nor have I seen the TV show. Still, as a law student, I figured I should at least try the first one out. I was pleasantly surprised by the mystery, and especially surprised by the fact that a lot of the law quoted here is actually real! This novel doesn't have any courtroom scenes, but a good defense attorney wins most cases during investigation, so even that was accurate. Also, the narrator does a great, hard-boiled, film noire, detective voice. If you're on the fence, this is a really fun trip. Enjoy! What did you love best about The Case of the Velvet Claws? Cendese is the single worst narrator I've heard. I've listened to several Perry Mason's now. His choice of voices are normal, Kentucky Colonel, bad Jimmy Stewart impersonation, mob muscle thug, breathless airhead female and a couple of others. All except "normal" are extreme and usually the voice does not go with the character. The judge might get the mobster voice, and Paul Drake usually gets the high pitched breathless voice. He totally misses the subtle voice changes for different characters used by other narrators. That said, I've listened to several and keep listening. I just accept that Perry Mason in general is formula, campy and anything but deep literature, and try to ignore the narration. Cendese also improved (some) as the series progressed. Bottom line. The stories are fun and worth listening too, just accept crappy narration as part of the package. I once attended a lecture where the premise was -- if you enjoy detective / legal stories, there are 2 types of people -- those that love "Law and Order' and those that enjoy "Perry Mason." I fall in the L&O crowd, but my husband loves the Perry Mason series on TV. On a recent trip, I loaded up this first in the Perry Mason series for us to enjoy on the drive. Our expectations were not met. I knew the story would be dated since this first book in the series was written in 1933, but was hoping for some charm. Nope -- the characterizations are incredibly weak and dialog is absolutely unbelievable. I thought Gardner would be a great author, but not so much in my opinion. My problems are much more than the dated format and mannerisms. His opinion of women is outrageous and during one of the witness interviews, the "N" word was used to our complete horror. We tuned out at that point. The narrator did not improve this terrible book. I thought the book was pretty good over all, but I thought two cuss words were used too much. and some places in the story were weak, but after seeing the tv show, I was interested. fantastic performance and excellent story. performer does multiple voices exceedingly well, and there is no discernible editing, which makes it very good. Best of 10 listened to so far. Narration was great particularly of the weasley former husband. The story pits loyalty of Mason to his client and the truth against the disloyalty of God client to him. Far better than the television episode of the same title. Expect to have to look past the insulting comments about women and borderline sexual harassment. But that's true about all novels of this period unfortunately. 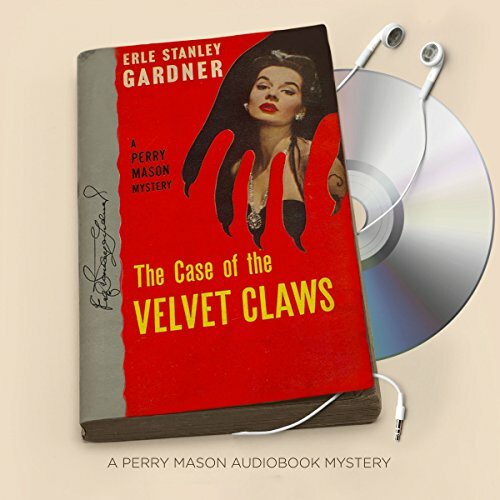 Erle Stanley Gardner introduced the famous character of Perry Mason in 1933's The Case of the Velvet Claws. A woman visits lawyer Perry Mason using the name Eva Griffin and asking for help because Spicy Bits, a scandal sheet known to be a conduit for blackmail is trying to shake her down. Perry follows the trail of Spicy Bits to its secret owner, a man considered to be a respectable member of society. Then, the man's wife walks into the room, changing everything. She is Perry's client, named not Eva Griffin but Eva Belter. Back at his office, Perry interrogates Mrs. Belter, exposing every statement of hers to him as a lie. Then in the earliest hours of the morning, Perry gets a phone call from Eva that her husband has been murdered. When he goes to meet Eva, he asks her what happened and is startled to hear her say that she recognized the voice of the man who shot her husband and that the voice belonged to Perry. From now on, Perry must engage in a game of wits to find the real murderer while staying out of jail himself. This book demonstrates why the name of Perry Mason continues to be famous, even among those who have never even known that the series was a set of books before becoming made famous by Raymond Burr as a television series. The plot kept moving rapidly, with such creative twists and turns that I found myself unable to guess where the book was going next. The three main characters in this series make regular appearances as fully formed characters, though other friends don't appear until later books. We get a clear sense of Perry as the suave lawyer who isn't afraid to take risks and is juggling many balls in the air at any given time. We see Della Street as the competent secretary eager to go beyond the call of duty out of loyalty, but also with a hint of love towards her boss. And Paul Drake serves both as Perry's detective on specific issues and loyal friend ready to back him up as needed. Alexander Cendese performs the audio edition of this book. With his deep voice, he sounds so realistically like I imagine Perry to sound, and he narrates the book very effectively and bringing an already lively book even more to life. I really enjoyed The Case of the Velvet Claws. It has been ten years or more since I last read any of the Perry Mason books, and I didn't remember their being so well- written and exciting. The narration of Cendese just adds all the more to the experience of enjoying this book. I give the book five stars! Would you consider the audio edition of The Case of the Velvet Claws to be better than the print version? What other book might you compare The Case of the Velvet Claws to and why?